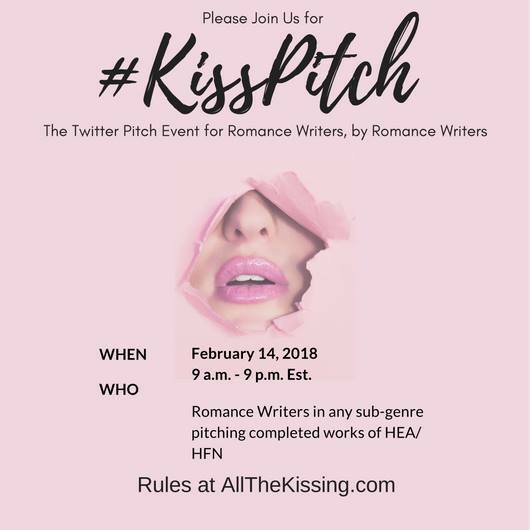 If you’re a romance writer with a Twitter account seeking representation, I hereby invite you to #KissPitch. This is what happens when you’re sitting around with a group of smart and savvy romance writers. We all love #PitMad, but pine for the days when the feed didn’t go by so quickly that there was virtually no chance of your pitch being read. Even with genre sorting, it’s tough. Not all agents and editors surfing the contest are interested in romance only. So, we thought, what if we ran a pitch event strictly for romance writers? Valentine’s Day was the only logical choice. So I’m happy to invite you to dust off your Twitter pitch-writing skills and join us for the event. You can find all the rules on All The Kissing. If you’re interested and want to practice your pitching, join the All The Kissing Facebook group, where we’re working together to help with pitches. Even if you don’t want to practice your pitching, you couldn’t ask for a finer group of romance writers. I’ve written before about Twitter pitch contests. Sometimes I love them. Other times I’ve been dismayed or confused by them. It’s fascinating to work on one from the inside. Actually, I could get to see both sides of it at once, since I’m currently querying a romance manuscript. Now that’s something to write about. Mark your calendars for February 14. If you have any questions, ask away either here, on our Facebook group, or @ me on Twitter. I’m happy to clarify or seek higher wisdom for you from my contest co-hosts. Feel free to spread the word. This is definitely a case of the more, the merrier. Categories: Writing | Tags: #kisspitch, all the kissing, twitter pitch contests, writing | Permalink.